In case you’ve missed how often I’ll wax poetic and nerd out about bacon, beef, and nearly all things cheese, no, I’m not vegan. My husband, however, is ova-vegetarian, so finding recipes that we can both enjoy, particularly for baked goods, can sometimes be a little frustrating. Also, while I love the meditative and often calming feeling I get when I’m really into complicated, involved recipes, sometimes I just want something quick, simple, and easy. Especially when I’m short on time and I’ve got guests coming or a gathering to go to. Somehow I’d gotten the impression that making scones required a lot of time and complicated steps. Thankfully, I was disabused of that notion recently – my friend Dawn (who when she’s not cooking or coding, runs the Raks Geek bellydance+fire showcase) shared her go-to scone recipe, which turned out to be not only fast and simple, but easily adaptable for non-dairy eaters as well. And because it’s me, I immediately started tweaking and playing with the recipe – as my mom taught me, there’s always room for improvement. Dawn and I have a long-standing debate whether or not chocolate is better when you add spices – she loves hers plain, but I’m always figuring out how I can add spices like ancho chili pepper, paprika, lavender, Chinese 5 spice, and ginger, just to name a few. Lately, I’ve been on a cardamom kick and cardamom tends to pair very well with chocolate, so I’ve added that in this recipe. I’ll definitely be playing around with other spices though – I adore chili and chocolate pairings, and lavender chocolate scones might be nice for afternoon summer tea. Dawn had also tweaked the recipe so that she was using hand-chopped chocolate, rather than chocolate chips, which works really well. The chopped pieces of chocolate vary in shape and size, and disperse in the mix a lot better. Chips are fine if that’s what you’d like, but it only takes a couple of minutes to chop what you need of a block of chocolate, and the effect is well-worth it. 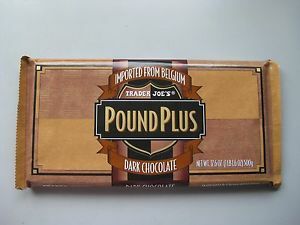 Most grocery stores will carry chocolate like Callebut and sell by the ounce, with large chunks pre-cut, but Trader Joe’s Pound Plus bars work very nicely and are a little easier on your wallet. (Several friends thought it would be a hoot to give me a 10-pound bar of Trader Joe’s chocolate a number of years ago when I visited them in Boston. It barely fit into my suitcase and lasted for years.) Just store the chocolate wrapped in plastic wrap or a ziplock bag in a cool, dark place. I prefer to use semi-sweet chocolate (for the Trader Joe’s pound plus bars, that would be the “dark chocolate” bar in the brown wrapper, not the 72% chocolate pound plus bar in the red one), but your mileage may vary. What was really surprising to me was the use of orange juice, rather than buttermilk, as the liquid ingredient pulling the dough together. I’m not always a fan of OJ and chocolate, but the OJ flavor was barely noticeable, other than a hint of tang, in the scones, and the acidity of the OJ worked just as well as the acidity of buttermilk. So really, the only thing I needed to adjust to make this a non-dairy scone recipe was substituting Earth Balance for butter. When you’re adapting dairy ingredients to make non-dairy substitutes, this usually means experimentation. One thing I’ve found is that when you’re substituting Earth Balance for butter in recipes that require “cutting” butter into dough, whether for shortbread, scones, or pastry dough for example, the Earth Balance needs to be hardened. Earth Balance softens very quickly at room temperature (even faster when you have warm hands like mine, which makes for somewhat frustrating efforts making pie dough), and it needs to be hard enough to mix properly with the dry ingredients. Your best bet is to toss the Earth Balance into the freezer, at least a few hours before you intend to use it, preferably overnight. At this point, I’m keeping at least one container of Earth Balance in my freezer at all times, because it just saves me the trouble. The spread will not become hard as a rock, but it will be much more akin to the texture of cold butter. Also helpful but not essential – tossing your large metal mixing bowl into the freezer for about 10-15 minutes to chill it. One annoying thing about using Earth Balance is that it’s harder to find it in stick form, which would allow for easier measuring by tablespoons or cups, so I’ve started to measure out the amounts needed using a small kitchen scale. I’m pretty good at eyeballing amounts of things, but precision is everything in baking and the amount of butter/Earth Balance is important to getting the right texture. I’ve found a small, electric scale is a fantastic and worthwhile addition to my kitchen – it allows me to switch between grams and ounces. Pro-tip: Always make sure you put the bowl you’ll be putting your ingredients into on the scale before you turn it on, so the scale won’t register the weight of the bowl, just the food you’re adding to it. A note about “cutting butter” into dry ingredients to make dough: It’s completely possible to do this using a food processor; a lot of people I know do this and swear that it saves time and hassle. My food processor’s a bit small and I’m just waiting for the mechanism to short out, but personally, I actually prefer cutting the butter in by hand because I think I get a better “feel” for when the butter’s been adequately worked into the flour mixture. However, if you’re going to do it by hand, do not skimp on your pastry cutter. There are several on the market that are essentially curved wire whisks, which in my experience, tend to bend rather than cut through hard butter or Earth Balance. You want to get something where the curved cutting blades are solid enough to withstand the pressure (the blades are not sharp like knives). 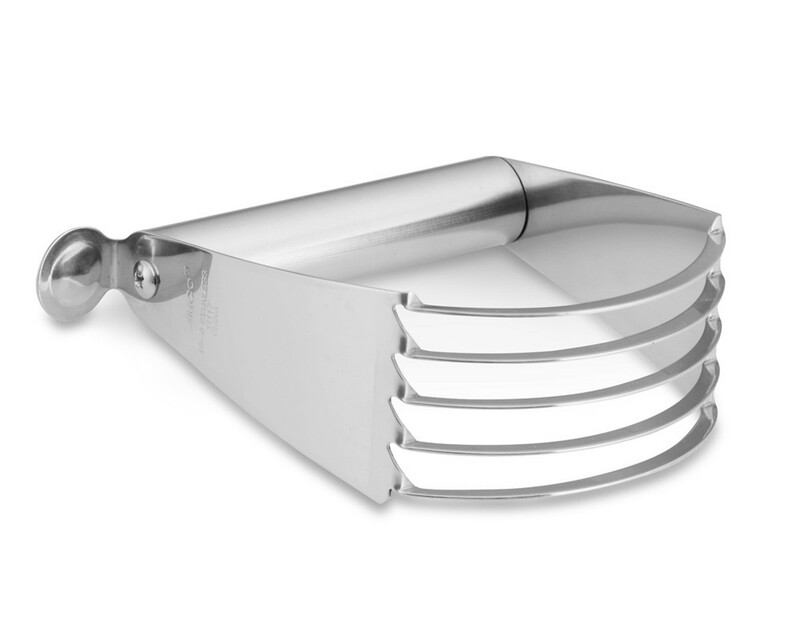 I got mine from Williams and Sonoma for $10.95, which has been repaid in countless batches of pie dough, shortbread, and other assorted goodies – Cuisinart, OXO, and other manufacturers make similar cutters, but this is the basic construction you want. 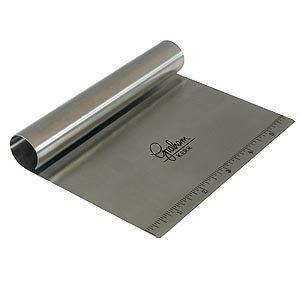 Also helpful but not essential: Having a flat pastry cutter/scraper. I use mine to cut both the Earth Balance/butter before using in pastry dough, and also cutting the dough into scone shapes. It also makes for easy scraping and cleaning up excess dough bits and flour left on your work surface when you’re done. They’re simple and inexpensive kitchen tools with multiple uses (such as scraping up onions, garlic, or other ingredients that have been chopped/sliced/etc). The dangerous thing is that these scones are extremely fast and easy to make, so you may find yourself making them a lot, and hopefully will tweak the recipe to your own preferences. I need to officially time this, but I’m pretty damn sure I’ve never spent more than 40 minutes on these scones, total (including prep, mixing, and cooking time). Pre-heat oven to 400 degrees. Spray baking sheets with nonstick spray. Chop chocolate into coarse pieces using a large kitchen knife. Set aside in a bowl. Mix flour, sugar, baking powder, salt and cardamom in a large, wide shallow bowl (shallow bowls are easier to “cut” butter into than deep bowls but you can use a regular large mixing bowl). Cut Earth Balance quickly using either a knife or flat pastry cutter, put pieces into bowl with flour mix, and “cut” Earth Balance into the flour mixture, using the curved pastry cutter, until Earth Balance is mixed with flour and mixture resembles a coarse meal (there will be pieces of butter mixed with the flour around pea-size). Or pulse Earth Balance and flour mixture in a food processor to attain that texture. Add chocolate pieces and toss to mix. Add OJ and mix by hand until dough is just sticky, do not overwork dough. Flour a flat work surface so the dough won’t stick to the surface, and mound dough onto floured surface. Lightly flatten dough into a 1-in thick disc and cut into “pie pieces” (12 total). Carefully put scones onto baking sheet & bake for 12-15 minutes, until scones just start to turn golden on the edges, rotating sheet halfway through cooking time. Remove scones from oven, let stand on baking sheet for 2 minutes, then use spatula to carefully move scones to cooling rack. Cover with a clean towel while cooling, they’ll be ready to eat in about 5 minutes. Store in an airtight container when completely cooled. 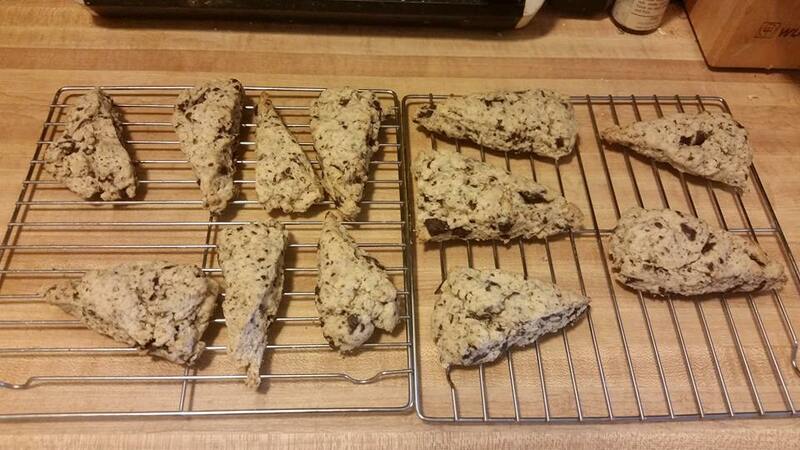 This entry was posted in Food and tagged cardamom, chocolate, food geekery, recipe, scones, vegan by Michi Trota. Bookmark the permalink.